New models, new styles and new engines are featured in this most exciting automotive year! THE wildest alleycat fight since Finnegan needled the beer is about to take place in the American automobile world for 1960. Not since the first post-war models of ’46 has the guessing board been so active in “The world’s biggest poker game,” as Pontiacs Bunkie Knudsen recently described the car industry to me. The second question is how the small cars of the Big Three will affect imports and how they’ll affect Studebaker-Packard’s Lark and American Motors’ Rambler. Any way it’s sliced, these three new entries are bound to cut into the imports, the Rambler and the Lark, unless George Romney’s thinking (and it’s been excellent up ’til now) is right. Romney feels that the Big Three entries will stimulate the entire small car field to such an extent that he’ll sell more Ramblers than ever—and the imports may benefit, too. The big deal in all camps will depend on how well these small ones go. 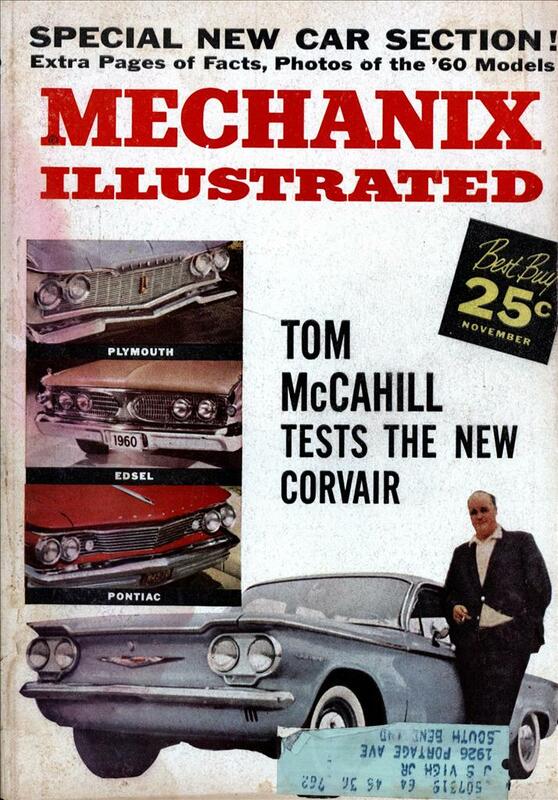 The Chevrolet Corvair is covered thoroughly in a test article in this issue, as Falcon was last month. This only leaves the Valiant to be accounted for. The Valiant looks as if it cost several hundred dollars more than either the Corvair or Falcon. Bill Newberg told me personally it would sell at “competitive” prices. When I tried to needle him as to what was “competitive” he said, “The Falcon and Corvair are the competition, naturally.” I couldn’t get a specific price out of him. In fact, I couldn’t get an exact price at this writing out of the Falcon or the Corvair men, although I was assured by both that it would be “about $2,000.” Now, if Newberg can match the Falcon and Corvair price tags, he’s going to give both these entries one helluva run because the Valiant has more power, more performance and superior looks plus the great Chrysler torsion-bar suspension (which no one has matched yet in this country). But now let’s take a look at what General Motors, Ford, Chrysler, American Motors and Studebaker-Packard have to offer for 1960 in their standard-size lines of cars. Here are the new models, styles and engines you’ll be seeing in this exciting automotive year. GM, top dog in the automotive world, has just completed an excellent year. What’s new with its number one dividend-payer, Chevrolet? The 1960 Chevy has gone in for a pretty heavy face-lift which includes knife-edge styling and a modification of its batwing tail. It still comes in three well- known series: Biscayne, BelAir and Impala, plus three station wagons. The power plants are all similar to those of ’59, meaning a Six and two V8s, one displacing 283 cubic inches and the other 348. A high performance “Police Special” will be available on special order in time for Speed Week, if you don’t happen to be a cop. Basically the ’60 Chevy offers nothing sensationally new. But as you and I know, it will sell in the hundreds of thousands. Pontiac for 1960 has made the guttiest change of the entire industry. While running miles ahead of all opposition in the medium-price field, and with the best look- ing cars on the road in 1959, they switched their styling completely for 1960. This took a lot of nerve but they’ll get away with it because their 1960 car has top looks, too. In ’60 the Pontiac line will be expanded with the addition of an entirely new series—the Ventura. On the price scale the new Pontiacs will start with the lowest cost Catalina, then Ventura, Star Chief and Bonneville. As everyone knows (with the exception of one inmate of the Old Ladies Home), Pontiacs were the performance kings of the nation in 1959 and, as if they needed it, they’ll be even a little sharper in 1960. Oldsmobile had a great year in ’59—one of their best in history. For 1960 they’ve done some style-jiggling and they’ve removed that silly chrome strip outside the driver’s window. The front hood-line has been reworked and, in my opinion, the style changes they have made have all been to the good. All models have been reduced slightly in overall length. The ’60 Olds will be powered by a 394-cubic-inch mill in the 98 and Super 88 series and a 371-inch twirler in the plain 88. These are good road cars with ample performance for just about every need. Olds should do well in 1960. Buick had a real bad year in 1959, which is hard to understand because they were the best Buicks ever built. They’ve been restyled considerably for 1960. It is anyone’s guess how they’ll sell but I will be very much surprised if dyed-in-the-wool Buick fans will be able to resist them. No ex-Buick owners will ever have owned cars this good. I feel that changing the well-known series names from Roadmaster, Century and Special may have hurt the ’59s a great deal. Even experienced auto men had trouble placing the new names: Electra, Invicta and LeSabre. For some old-time Buick men it might have been like a kid trying to get used to Frank Sinatra playing a clean-shaven Santa Claus. Cadillac, the hottest-selling high-priced car in the world, will undergo no major changes for 1960. The power plant is still the same 390-cubic-inch mill developing 325 or 345 horsepower, depending on model. All are on a standard wheelbase of 130 inches except for the Fleetwood limousine which is slightly shorter than a ferryboat. 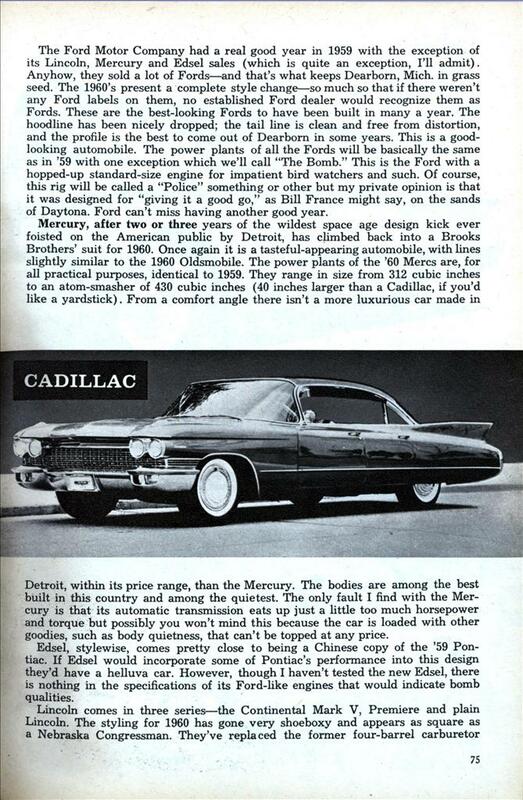 Regardless, the safest bet in the book is that Cadillac will still .outsell all other high-priced cars in 1960. The Ford Motor Company had a real good year in 1959 with the exception of its Lincoln, Mercury and Edsel sales (which is quite an exception, I’ll admit). Anyhow, they sold a lot of Fords—and that’s what keeps Dearborn, Mich, in grass seed. The 1960’s present a complete style change—so much so that if there weren’t any Ford labels on them, no established Ford dealer would recognize them as Fords. These are the best-looking Fords to have been built in many a year. The hoodline has been nicely dropped; the tail line is clean and free from distortion, and the profile is the best to come out of Dearborn in some years. This is a good-looking automobile. The power plants of all the Fords will be basically the same as in ’59 with one exception which we’ll call “The Bomb.” This is the Ford with a hopped-up standard-size engine for impatient bird watchers and such. Of course, this rig will be called a “Police” something or other but my private opinion is that it was designed for “giving it a good go,” as Bill France might say, on the sands of Daytona. Ford can’t miss having another good year. Mercury, after two or three years of the wildest space age design kick ever foisted on the American public by Detroit, has climbed back into a Brooks Brothers’ suit for 1960. Once again it is a tasteful-appearing automobile, with lines slightly similar to the 1960 Oldsmobile. The power plants of the ’60 Mercs are, for all practical purposes, identical to 1959. They range in size from 312 cubic inches to an atom-smasher of 430 cubic inches (40 inches larger than a Cadillac, if you’d like a yardstick). From a comfort angle there isn’t a more luxurious car made in Detroit, within its price range, than the Mercury. The bodies are among the best built in this country and among the quietest. The only fault I find with the Mercury is that its automatic transmission eats up just a little too much horsepower and torque but possibly you won’t mind this because the car is loaded with other goodies, such as body quietness, that can’t be topped at any price. Edsel, stylewise, comes pretty close to being a Chinese copy of the ’59 Pontiac. If Edsel would incorporate some of Pontiac’s performance into this design they’d have a helluva car. However, though I haven’t tested the new Edsel, there is nothing in the specifications of its Ford-like engines that would indicate bomb qualities. Lincoln comes in three series—the Continental Mark V, Premiere and plain Lincoln. The styling for 1960 has gone very shoeboxy and appears as square as a Nebraska Congressman. They’ve replaced the former four-barrel carburetor ‘ The Chrysler Corporation would have had a real good year if production hadn’t been halted for months by a glass strike. As it was, they made up for lost time after they got going and wound up with a healthy profit. Plymouth, Chrysler’s mainstay, has undergone dozens of changes for 1960, not all of them obvious from the outside. They’ve switched over to unitized construction—body and frame combined into a single, all-welded structural unit—and the styling has been modified, although not as drastically as on some other cars in the Chrysler line. A Plymouth equipped with the 361 Golden Commando will run the ears off anything in its class as it comes from the showroom. It will outjump any other American car up to 60 mph (with the exception of the Pontiac) and will match the Pontiac down to the tenth of a second. The Plymouth is my choice as the Top Buy in the low-priced field. This year it has a new overhead-valve, six-cylinder engine in addition to the V8s. The Six is mounted 30 degrees from the vertical, a la the Valiant and Dart, a trick they all swiped from Indianapolis. These are the best road and cornering cars in their class. Dodge has undergone a complete styling and doesn’t look any more like Dodges of the past than I look like The Thin Man. The big news at Dodge for 1960 is its new small-size Dart built on a 118-inch wheelbase (same as Plymouth) but slightly shorter in overall length and width. This is a good car and may attract a lot of guys and girls who really don’t want a big rig and don’t go for a small one. For those on-the-fencers the Dart may be a sharp choice. Personally, I’ll be a pretty surprised guy if the Dart doesn’t prove to be the hottest-selling kid since General Pershing ran around in a four-cylinder Dodge during World War I.
DeSoto for 1960 has been completely restyled and looks no more like former DeSotos than DeSoto himself did. Like the Chrysler line, it has stolen its grille from the Chrysler 300 which was the best-looking in the industry, in my opinion. These are good, rugged automobiles. The New Yorker is the head boy for the cars that sell under the Chrysler Corporation name. Chryslers also come in the Saratoga and Windsor series. It’s my personal bet that the Chrysler New Yorker will go down as the Looks Champ of the industry this year. With its 300 grille and a county-full of swashbuckle and gutsiness I don’t see how it can miss with buyers who have any adrenalin left at all. These are big gutty cars with the best suspension and handling in the entire industry. Like all cars in the Chrysler line for 1960 (with the exception of the Imperial), they are featuring unitized construction. The Imperial is the best car made in America, in my opinion. For 1960 they’ve jiggled the tail fins so they somewhat resemble recent model Cadillacs. Although I won’t give them a plus for this, on the basis of their outstanding performance, sports-car handling and the way they’re put together, if you want the best car made in America, there is no other choice. Now let’s look at American Motors, the outfit that in 1959 more than doubled the ’58 sales of its amazing Rambler. Rambler for 1960, as in ’59, comes in three sizes: 100-inch, 108-inch and 117-inch wheelbases. The larger two have undergone some styling changes which, though not radical, have removed some of the bad lines of last year. In other words they’ve cleaned them up and the fin lines will be much easier to live with. The Rambler American, my choice as a top dollar value for some time, is basically the same as it has been for several years. The Ramblers are good automobiles, honestly made, and if you should buy one I feel positive you’ll be happy about the whole thing. There’s not much else I can say aside from the fact that in 1959 they had their best year in history and elbowed out many old-liners of the Big Three. They did it with product alone, as American Motors just doesn’t have the kind of advertising money available to the Big Three. About the only sensational news out of S-P for 1960 is the introduction of the Lark convertible. Larks come with Six or V8 cylinder power plants. A four-door station wagon is also new for this year. Lark had a good year, saleswise, and as you know, this may be just one other inspiration that caused the Big Three to move into the smaller-type car field. In 1959, a Lark won the Economy Run at the Daytona International Speedway. So that’s about the way the new cars look for the coming year. How good a reception will they get? I think that as the three new compact cars go, so will go the market. They will serve as a definite barometer for American automobile thinking for many years to come. If they show immediate success and cut out a bigger hunk of total sales than anticipated, there will be at least three and possibly four additional entries in the small car field by this time next year, all sponsored by the Big Three. Just to be on the safe side, two new ones are already being readied for 1961. Tom McCahill has always been one of my favorites, and I always enjoy his articles when they are posted here. As critical as he was known to be towards mediocre US cars, I wonder how he would feel about the current state of the US auto industry? I like the last paragraph at the end. I’m so glad square steering wheels never really took off! The square wheel may give more knee room when driving straight, but when turning it will still hit one’s legs. Just one more reason the US auto industry is doing so well. Uncle Tom’s Mopar bias is showing pretty strong in this article but it’s still a great read. His admiration is forgivable, how could he resist those swoopy lines of Exner’s Forward Look? I thought the square steering wheel came out earlier when they first introduced Full Power steering, it was about the only way to know you were centered up. Funny that he still gives a nod to Packard when referring to Studebaker, but I guess technically that was still the name of the outfit in 60. How about that light hearted last comment of his about gas prices jumping up to 60 cents? That’s like us worrying about 5 or 6 bucks now! Oh wait…. Our other McCahill memories involved his ultimate trunk-test strategy: seeing if one of his rather large hunting dogs could fit in the trunk.